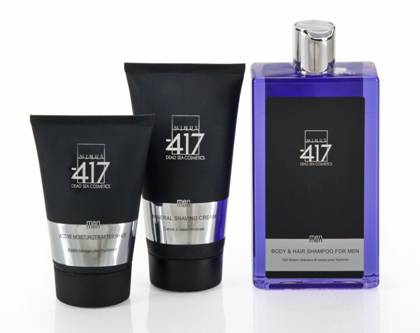 I wasn’t very impressed with the products from Minus 417, which symbolized everything that’s wrong with a lot of supposed “high end” men’s skin care products that are on the market. Just because it contains a litany of exotic sounding ingredients and is high priced ($98.00 for the kit), it doesn’t mean it’s good. Hyped as a product that was enriched with “dead-sea minerals” and “vitamin A, vitamin E, sweet-almond oil, carrot-seed oil and olive oil,” it quickly devolved into a cacophony of ingredients. The dizzying array of natural substances that comprised the line, from what I could tell, was all hype. I can’t tell the difference between a dead-Sea mineral and carrot-seed oil once it’s on my skin, but if it’s a moisturizer, make it refresh my skin and keep it moist for an extended period of time. If it’s a shaving cream, make it easy to apply to my skin, shave and rinse off my blade. The first sample I used from the Body Care Kit for Men was the Mineral Shave Cream. I could tell from the moment I put it in my hand, just by the texture, that it wasn’t very good. I squeezed a large amount from the tube into my hand and rubbed them together, but when I did that, instead of having the product expand like most shaving creams, it gradually dissipated thanks to the friction in my hands. So, I squeezed out even more and did the same thing, this time applying some water, but it didn’t help either. After a third squeeze, I got enough out to apply on my face, but it immediately began to sting. Not only that, but it felt like I was putting lotion on my face rather than a shaving cream. It got to the point where I was literally glopping it on my face to cover the entire area. I started dragging the razor across my face and it came up pretty easily; I didn’t have to go over the same area multiple times. But getting the cream out of my razor was a pain, and a thin layer of it coated my sink when I was done. It was not a pleasant experience. After I washed my face, I applied the Active Moisturizer After Shave. In addition to the scent being completely overbearing, I could tell from the minute I applied it I would have to keep putting it on, over and over, because one application dries your skin out rather than moisturizing. After I put it on, my skin was dry and flakey, worse than if I hadn’t applied anything. Finally, I used the Body & Hair Shampoo for Men. It was akin to the free shampoo you get from a hotel when you forget yours; it just wasn’t very good. I was not impressed with any facet of the Minus 417 Body Care Kit for Men. It reminded me of a cheap substitute attempting to masquerade as a high end product. You can put a pig in a dress, but at the end of the day, it’s a pig wearing a dress. Check out the company’s official website for more information.